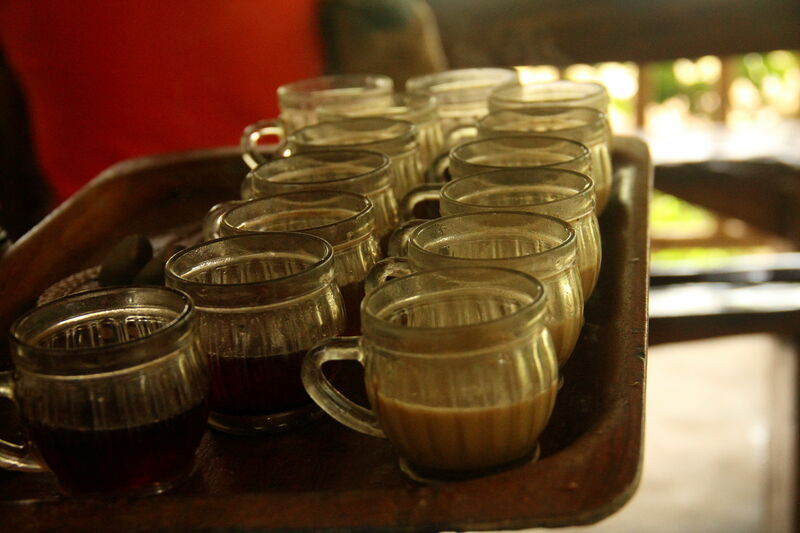 Coffee tasting in Ubud was never on our itinerary. 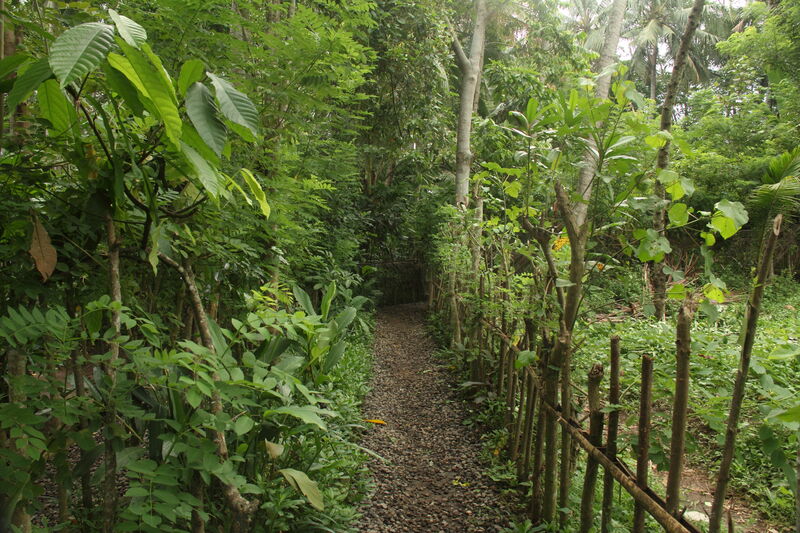 While we were in Ubud, our driver insisted that we visit the spice garden and coffee plantation. Hoping that being a local, he would give us wise advice, we went along with the idea and found ourself in a spice and and coffee plantation called Teba Sari about 15 minutes away from the Monkey Forest area. Our driver took our vehicle off the tar road, to a dirt track, which ideally should have been a one way passage. He drove for a couple of hundred meters and parked the car amidst lush green surroundings. We breathed in some fresh air and stretched our tired bodies. I yawned like a lazy hippopotamus and craved some good coffee, glad that the craving hit me in a coffee plantation! Within a couple of minutes, we were escorted by a young lady who led our senses of smell and taste into a world of discovery. We are from India. Our food is laced with spices. If an Indian dish does not have cumin, turmeric and a host of their spicy buddies, it really does not receive much appreciation from the Indian palette. I stock all these spices at home in little transparent air tight jars. I assumed when I would see them on the mother place, fresh and green, I would be able to identify them. My assumption was totally incorrect! I had no clue what a cardamom plant looked like…or how cinnamon bark is rolled into a fancy stick. Spices aside, I was totally excited seeing a cocoa tree. 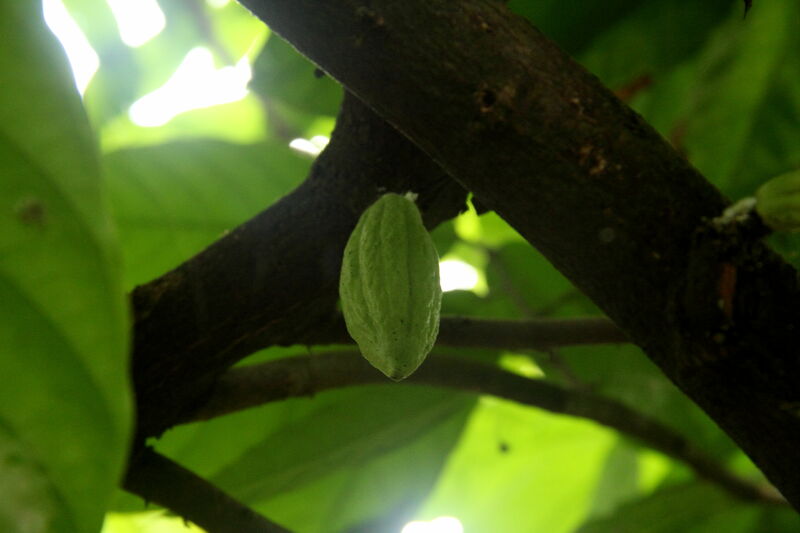 I still don’t know how this green fruit is processed to yield the rich dark chocolate that lifts up my moods. I think it is time to add Madagascar to the bucketlist…just to see cocoa being processed. The spice garden also had a few Arabica coffee plants, with ripe coffee berries. We did not see any large coffee plantations, which are typically in the Kintamani area Ankur and I have both seen vast coffee plantations in Coorg. 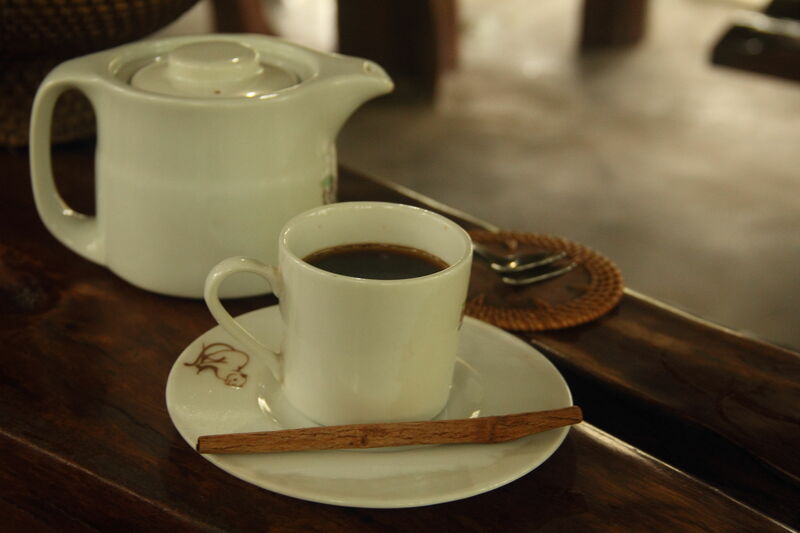 What had us excited was the very famous ‘Kopi Luwak’ that Indonesia is so famous for. It is amongst one of the most expensive coffees in the world and Indonesia, we could afford to have a cup full! Kopi Luwak is also know as ‘cat-poo’ coffee. Is that self explanatory? Or have you already hit Google search with ‘Kopi Luwak’? For those who haven’t, the civet cat feeds on the best coffee berries in the wild… natural selection at its best. The beans pass through its alimentary canal, where fermentation occurs and the beans are subjected to it’s digestive juices. They are then defecated, and hence the name ‘cat-poo’. 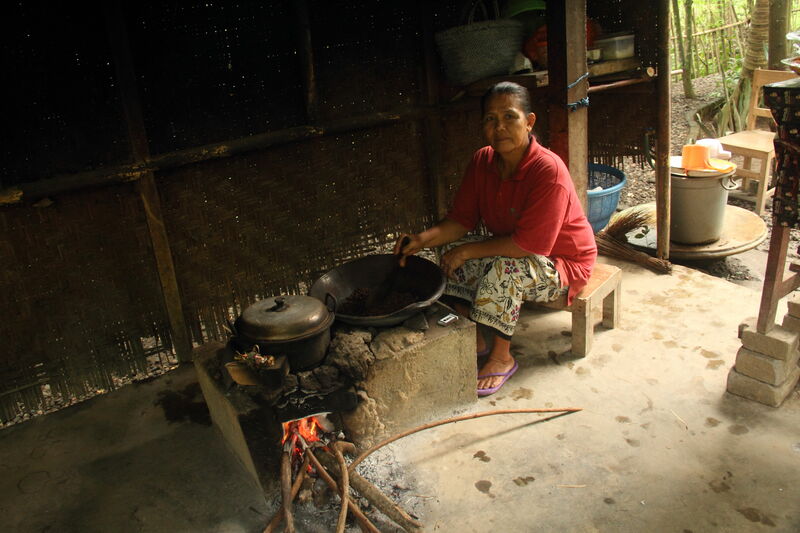 How is Kopi Luwak processed? Droppings of the civet cat are collected by locals. They are then washed, cleaned and dried. Every bean is covered by an outer skin called parchment. When sufficiently dry, the beans are pounded which breaks off the parchment. 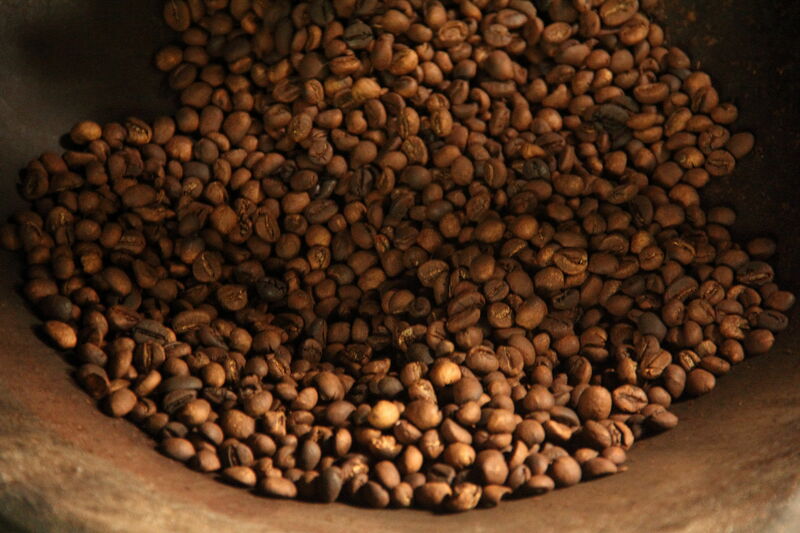 After the parchment is removed, the beans are dry roasted, thus yielding the famous and flavourful Kopi Luwak. After walking through the spice garden and saying a hello to the civet cats who were busy digesting the beans, we headed to the ‘tasting table’. The large wooden table under a thatched roof seemed to blend so well in the natural surroundings. Our hostess came with a menu and numerous cups, filled with a variety of tea and coffee. This included the usual lemon tea, lemongrass tea & Balinese coffee and some really fancy stuff like mangosteen tea, vanilla coffee and coconut coffee. And then, came the coveted Kopi Luwak, which had a strong aroma, especially when compared to the Balinese coffee. The exploratory traveller in our soul urged us to go on and take a sip, and we did! What does Kopi Luwak taste like? Kopi Luwak is had without any addition of milk or sugar. Put a spoon of the coffee powder in a cup, and some boiling water and stir. Then wait for the magic to release and the powder to settle. Voila! Its ready to drink. If you fancy some additional flavour, dip a cinnamon stick and enjoy the aroma. The warm concoction was a rich, well rounded coffee. Even though there was no milk or sugar added, the coffee did not taste bitter at all. The vapours treated our sense of smell and the coffee treated our taste buds…and both were treated like royalty. The civet cats’ guts sure did do a great job! Visit to the spice garden was free. So was tea and coffee tasting. The only thing that came with a price tag on the tasting table was the pot (two cups) of Kopi Luwak, which cost us Rp 100,000 for the two of us. There is a store that sells all the teas and coffees that are on the tasting menu. Besides that, there is a collection of scented oils, soaps, incense sticks etc to choose from if you intend to ‘Balin-ise’ your home. We had some Kopi Luwak at Teba Sari, but our concern on the way the civet cats are kept and treated all over South East Asia and India continues to bother us. 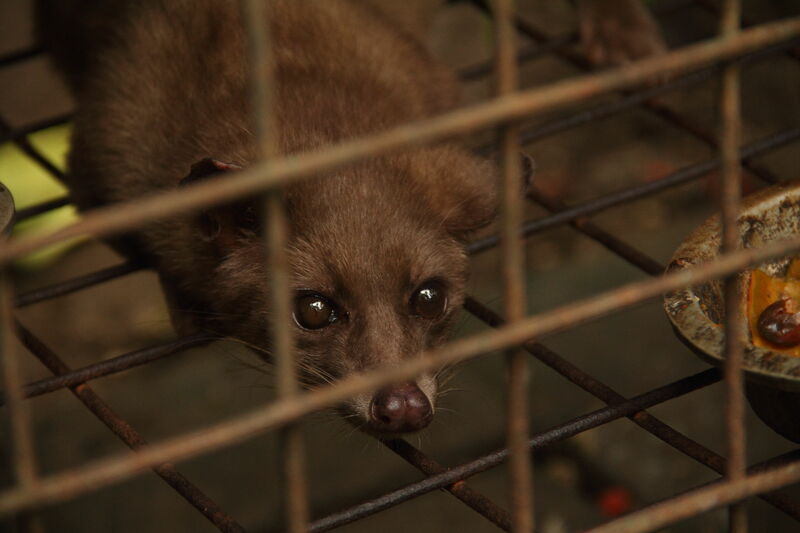 With an increasing demand for Kopi Luwak, coffee growers have started caging the civet cats and force feeding them coffee beans. Thus, there is no natural selection and a wild animal loses its freedom. Not to forget, mortality rates for the civet cats in captivity are high. While we were assured by the Teba Sari staff that the cats in the coffee plantations at Kintamani are free to roam and the ones at the spice garden are the only few kept in captivity to educate tourists, my heart went out to those in the cages. That’s me! I also feel bad for a tiger that is caged in a zoo instead of hunting in the jungle. While we recommend visiting the spice garden, tasting the Kopi Luwak depends on whether you are up for it….for drinking ‘cat-poo’ coffee, while being unsure of how happy the cat was! If coffee tasting isn’t your thing, you can still enjoy the place. They have a lovely restaurant set in the middle of a paddy field, with a brook running next to the al fresco area. 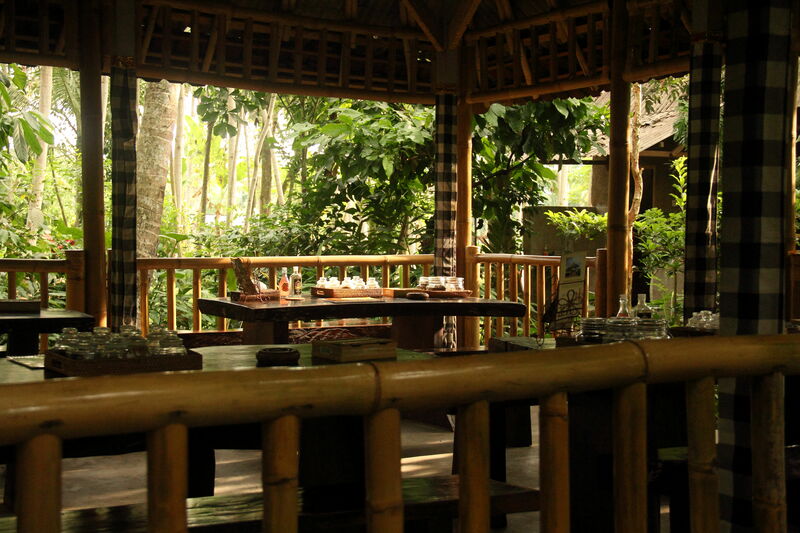 The setting is rustic Balinese and the greenery all around with let your eyes and mind feel refreshed. They provide pick up and drop from Ubud area if you choose to dine with them. There is something to keep the kids excited – a huge snake along with a care taker. I did dare to touch it and it sure did take some guts! There is also a wise owl that seems to be lost in thought. The chocolate at Teba Sari was excellent. The cocoa is grown locally in Bali and the local process of chocolate making ensures that it does not melt in the Tropical heat. Did I mention that chocolate tasting was free as well? We picked up a couple of bars and for the last one month, I don’t have to hunt for dessert in my fridge. Have you ever had Kopi Luwak? Do you think you would ever want to have some? Let us know! Sid…The flavour sure was interesting…unlike any coffee that we have ever had. Its just the ethical dilemma that bothers me now. What I would give right now to go back to Bali and drink a cup of Kopi Luwak! That stuff is goooood! I did feel sorry about the civet cats though, but at least, in the farm we visited, they seem to be well-fed and their cages are clean and spacious. I just hope they are being treated right even when there are no visitors around! P.S. That block of chocolate looks yummy! Coffee tasting sounds so interesting. I’m from Vietnam and it’s really famous for coffee as well. I love to taste different coffee when I visit different places around the world. Would love to try it at Ubud! I just got back from Vietnam and I love your coffee there! Ohhhhh … I wish I could have got much more than I did! Oh I’m like you! Love my spices. The ethical concern sure did leave us feeling worried! Munduk is on my list when I go there next! I also went on a Kopi Luwak tasting when I was in Bali! I love learning about it and its taste and aroma. I have a similar concern about the caging of civet cats though – I guess as a customer, what we can do is to carefully choose where we actually buy the coffee from. Wow, there seems to be a great list of things to do in the spice garden, we had been to one in Kerala which had just spice plantations. And we loved a walk through the exotic plants. We knew the cat poop coffee as the world’s costliest coffee but we did not really know how it would taste. Thanks for sharing your experience with us. Every place has unique spices … lived the gardens in Sri Lanka, Kerala and Zanzibar! I do not drink coffee but I am very eager to drink a cup of Kopi Luwak. It is pure and probably invigorating too. I want to eat some Cocolate too. It looks interesting and delicious. Overall, I would really like to visit this serene place. To add to it, they had a wonderful restaurant in the middle of the rice fields … must visit! THey had some excellent teas … you will be a happy soul! I would love to go for a coffee tasting as I am such a big fan of coffee. I have heard about the “poo” coffee but I hadn’t realised that the animals get caged. That is so sad and I which people would be more educated about things like that. Totally … I strongly believe that people need to know more about the plight of the cats …wonder can something be done to ensure they live well and still give coffee lovers their kopi luwak? I cannot survive a day without coffee! My friends recently visited Ubud and couldn’t stop talking about it! So I’m really tempted to visit Ubud now.. I’ve heard of Kopi Luwak as well. Though its a bit weird, I’d love to try that too!!! Btw who doesn’t love chocolate, and I’m no different! 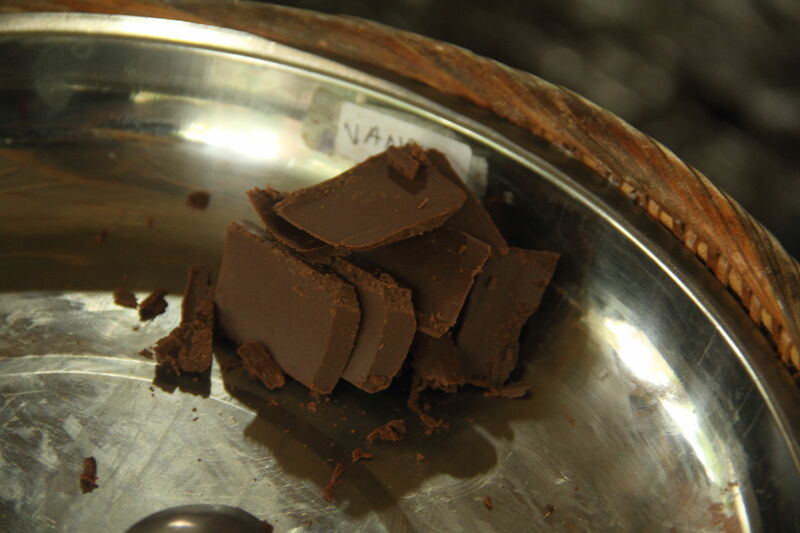 The chocolate was awesome… I got so much of it back to India!